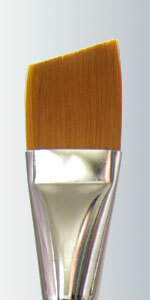 Short, flat, synthetic brush with a chiseled edge. Eyeliner, Lip liner, Eyeshadow, Eyebrow, Camouflage. Great for Face Painting. Golden Taklon Flat. Sharp chisel edge. Lip Liner, Lipstick, Eye Liner, Eyeshadow, Camouflage. Great for Face Painting. Golden Taklon Angle. Lip Liner, Eye Liner, Eye Shadow, Eye Brow. Great for Face Painting. Golden Taklon Angle. Lip Liner, Eye Liner, Eye Shadow, Eye Brow. Great for Face Painting. 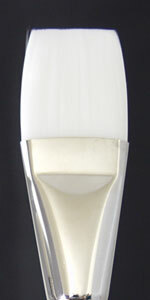 Champagne Handle is a clear acrylic handle with sparkles inside. 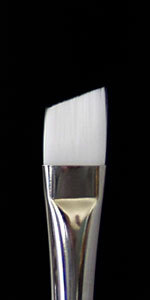 Soft Synthetic White Nylon Flat Brush. 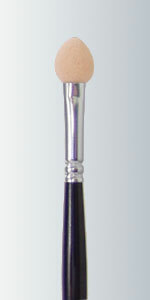 Used for Eye Shadow, Eye Liner, Lips, Lip Liner. 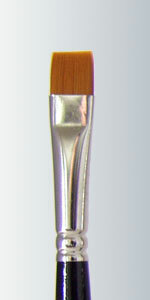 Also used for Face Painting. Soft White Nylon Oval. Foundation, Concealer, Eye Shadow, Lips, Finish HD, Camouflage Powder. Also good for Face painting. Soft White Nylon Angle. Used for Eye Liner, Eye Brow, Eye Shadow, Lip Liner, Lips. Also great for Face Painting. Golden Taklon Oval. Foundation, Concealer, Lips, Eyeshadow. 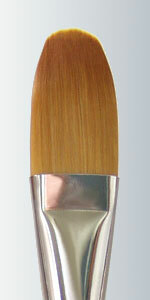 Great brush for Face Painting. 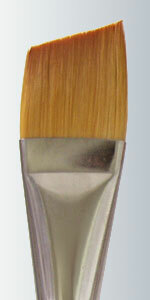 Sponge Applicator. Used to apply and blend eyeshadow to the eyes.